"We carry out Mortain's will when He wishes to alter the warp and weft of life's weave for some purpose of His own. and while that sounds like a lot of religion it really didn't come off that way, maybe because the religion of the people of Brittany is different than most religions, at least the ones that I have knowledge of. I still enjoyed this book very much even though I really don't like to read religious books. I think it was all the gritty history involved in it. Looking down at my bodice, the fool relaxes. Are men truly such idiots that they cannot resist two orbs of flesh? I comfort myself with the knowledge that if Duval ever feels smothered by me, it will be because I am holding a pillow over his face and commending his soul to Mortain. 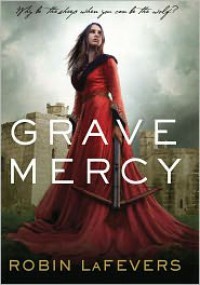 The story centers around Ismae, who has become one of death's handmaidens, which basically gives her a license to kill. She is sent out on assignment and gets caught up with Gavriel Duval and all the court intrigue involving the duchess. And so the story ensues. "When one consorts with assassins, one must expect to dance along the edge of a knife once or twice." I would recommend this to anyone who likes a clean historical romance, with a gripping story line and stimulating characters.